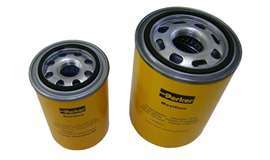 Suction filters are designed to filter the oil prior to the pump, therefore protecting the pump from contamination. For this reason, suction filters are often referred to as safety filters. 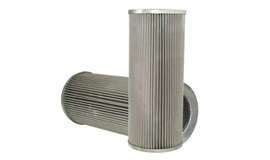 Suction filters are categorised into Strainers/Suction Elements, Spin-On Filters and Tank-Wall Mounted Filters. Suction elements/strainers are widely used as they are cost effective & are housed within the reservoir thus reducing the need for any external work. They are typically made with a 125-micron wire mesh media to remove large particle that may find their way into the tank & protect the pump. The negative aspect of strainers is that they have no indicator or bypass & because they are inside the tank it is not possible to know when they need changing. A strainer that is left indefinitely will ultimately become so blocked that it will reduce the oil flow to such an extent that it causes cavitation of the pump. Spin-on filter – see above but amend flow rates to 80 l/min. Tank-wall mounted filters such as the MP Filtri SF2 series are designed with a built-in valve that can be closed by use of a handwheel to enable a change of the element without emptying the reservoir. Elements are typically available with 25-250 micron ratings.